Below are some examples of Liposuction/Liposculpture Before and After Photos by Dr Robert Drielsma, one of Sydney’s leading specialist breast surgeons. Liposuction/Liposculpture procedures in Sydney by Dr Robert Drielsma. Dr Drielsma uses the new S.A.F.E Lipo-sculpture technique. This stands for Separation, Aspiration, and Fat Equalisation. Further, with over 25 years experience you will be very satisfied with the shapely result of Dr Drielsma’s approach. View further before and after results showcased above. These are typical, 100% realistic results that you too can achieve. 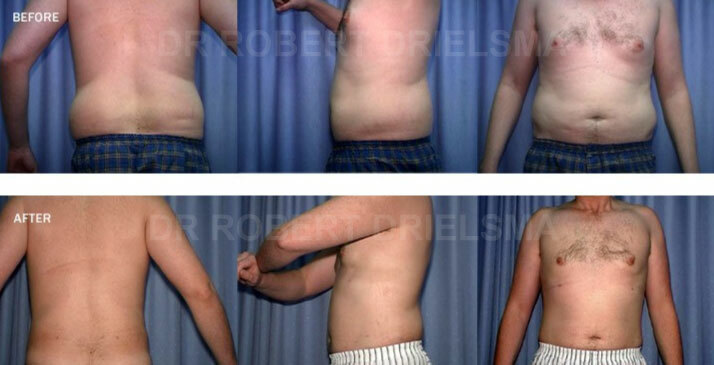 Further examples of Liposuction/Liposculpture Before and After Photos are also available at our clinic. These can be viewed during your consultation as some previous patients prefer we show their before and after images in our clinic. Dr Robert Drielsma, a highly experienced specialist breast surgeon, also focuses on natural-look results that can help you balance your natural proportions. Further, he only operates from accredited major hospitals using only experienced anaesthetists, with a top team of surgical support staff. Every woman has a unique body shape and overall body proportions. As a result, Dr Drielsma is highly experienced in working with any number of body types to create natural look results. During your consultation, Dr Drielsma will discuss your desires and options, ensuring you are informed on your achievable options. Also book a consultation with Dr Drielsma by paying the $100 deposit for consultation fee.